I confess, I'm a puzzle junkie, that's one of the reasons I took so easily to computer games. Among others, I love crosswords, mazes, minesweeper, word games, numerical puzzles and, of course, jigsaw puzzles. Jixxa is very simple and intuitive to play with a combination of mouse and keyboard controls and a cursor that changes to indicate what actions are possible. 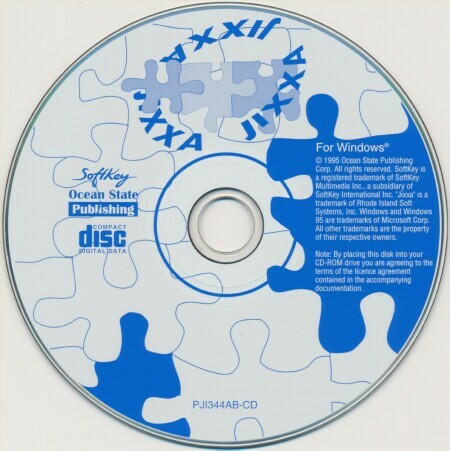 On installation the program loads a single puzzle to your hard disk and other puzzles can be found by opening the file menu and accessing the CD-ROM. There are four levels of puzzle available: large, medium, small and tiny and each level contains twelve puzzles with the pieces shrinking progressively. Though I thought the larger level might have been aimed at younger children this is not the case as the puzzles in each level are identical meaning that there are no puzzle pictures with children's themes. Open up a game, load a puzzle, and there are lots of extras available to help ... or hinder ... depending on your preference. For instance, as you slot fitting pieces together there's a reassuring 'snap' and those pieces become a single 'object' to move around the screen. If you want to vary the difficulty you can opt to have non-matching pieces lock together (just like the 'real' thing) and work out for yourself whether or not you've got it right. Of course there is the option to 'unlock' as well ... just in case. There's also a choice to have all the pieces oriented correctly, or you can engage the 'rotating pieces' option and work out for yourself which way they go. You can even call on help to find a matching piece or, if your patience runs particularly low, you can have the program do the hard work for you. 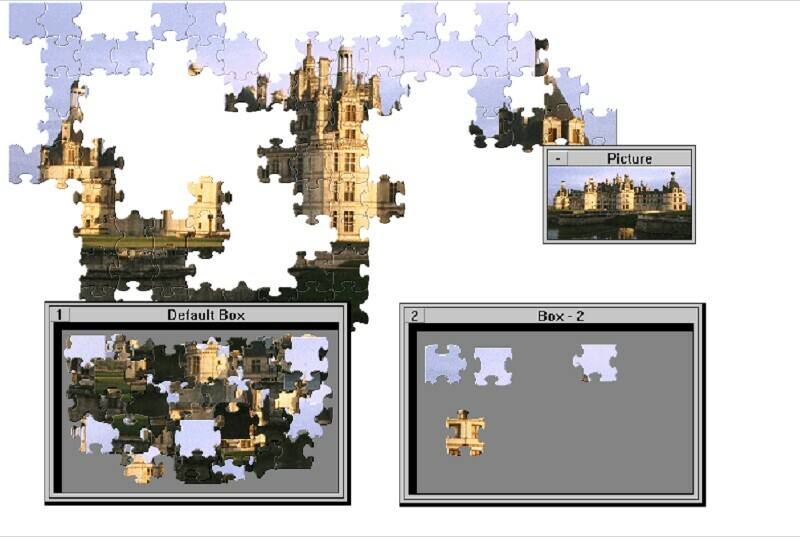 The game plays on a large scrolling screen and it is possible to open up to nine windows (boxes) to organise puzzle pieces. These boxes can be moved around the screen and resized to suit. 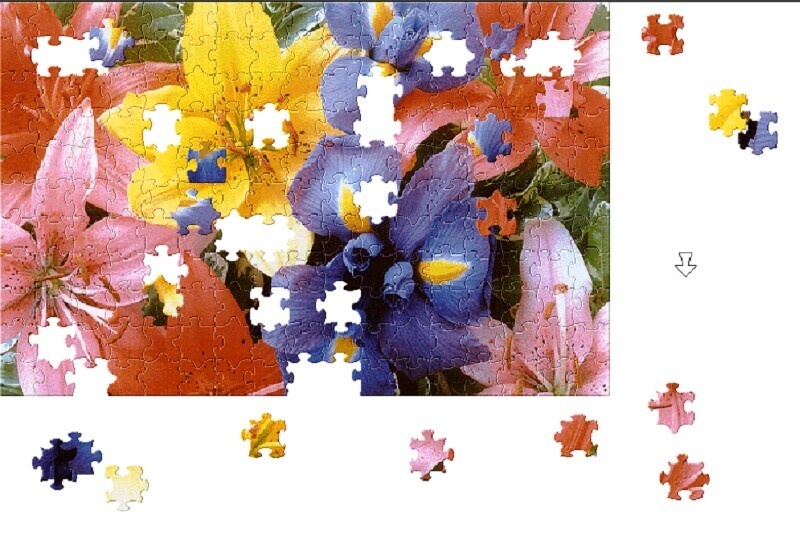 There are numerous options for hiding boxes, opening them individually, dumping them etc, as well as for viewing the puzzle picture as a resizable graphic or in full screen. There's even a clock to race against, although I don't know any self-respecting jigsaw puzzler who'd want to spoil their fun by rushing. So you miss out on that wonderful tactile experience of sorting through all those little bits of colored cardboard, but Jixxa still has an incredible amount going for it. To begin with, Jixxa puzzles need not interfere with 'life' because they don't require an enormous space; there's room at the dinner table to eat. You are not rewarded with an aching back for your troubles and, not that it has ever happened to me, of course, but you can't loose puzzle pieces. Also, you can just 'save' a puzzle at any time and come back later with no worries about the cat or the kids spreading it from one end of the house to the other. Jixxa is a very satisfying package for busy jigsaw enthusiasts with many options to sort and manipulate puzzle pieces and a good measure of that pulling power'to wile away lazy Sundays and ensure that the garden turns into a jungle. Did I say that it wouldn't interfere with life?